Microsoft has released full details about Windows 8 on ARM and spoken to us about it - but there's one revelation that stands out from the rest. 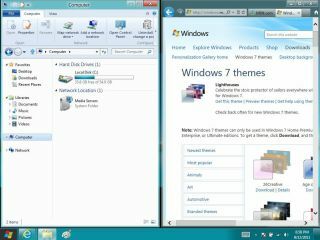 You will get the traditional desktop with Windows 8 on ARM - but you won't be able to put third-party apps on it. That's because all the third-party apps developed for ARM-based Windows 8 devices will be for the new Metro interface. However, it doesn't mean the death of desktop-style apps on WOA - what Microsoft calls Windows on ARM. You'll still get familiar apps like Explorer, Internet Explorer and the Windows Live apps (which will no longer be called Windows Live) plus Office – but everything else will be Metro. "All Metro-style apps will run on WOA just like you would expect," Sinofsky confirmed to TechRadar in an interview with TechRadar; "it's the same experience". Those are apps written in HTML5, VB, C# and XAML – and in C++ if developers prefer. That's the language most x86 Windows programs are written in, though you can't just turn an existing x86 Windows app into a Metro app (which would be a bad idea for a lot of different reasons). WOA will come preinstalled with what Microsoft has previously been calling the next wave of Windows Live apps for Metro, hardware accelerated for speed. And, while you'll get Office apps preinstalled, you will not get Outlook. "You also get the Windows desktop itself; for working with files, for control panel for working with devices and peripherals, Explorer, desktop Internet Explorer - all of that is part of the WOA product." Windows 8 for ARM tablets will come out at the same time as Windows 8 for x86 PCs but while there will be a beta for the x86 version, there will be no such concession for the ARM version. Neither will you be able to port the ARM Windows 8 version to Android devices (or install Android/Linux on Windows 8 hardware) - it will only ship on device. Microsoft also says that Windows 8 ARM tablets will have no vendor integration to slow them down, while all updates will come directly from Microsoft. "All the updates, whether for firmware, drivers or apps, will only come through the Windows Update or Microsoft update infrastructure and the Store," said Sinofsky. Read TechRadar's full Windows 8 on ARM interview.